A female ruby-throated hummingbird drinks at a hummingbird feeder in Franklin in this Aug. 19, 2012, file photo. Having a hummingbird grace your yard feels like a magical experience, like being visited by a fairy. Different kinds of hummingbirds can be found all across the United States, passing from South and Central America to Canada and the northern United States as they migrate with the seasons. If you are ready with a tasty snack, the spritely birds may stop to rest and feed in your yard, and you can watch their charming aerial acrobatics. You can buy hummingbird food at the store, but it is very easy to make with ingredients you have in your kitchen. Experts agree that the best ratio for hummingbird feed is 4 parts water to 1 part white granulated sugar. A standard eight to twelve ounce store-bought feeder will use about one cup of water and a quarter cup of sugar, but you can make a large batch and store the extra in the refrigerator as well. Even if you avoid using regular white sugar in your own diet, it is the best option for the birds. White granulated sugar contains sucrose, which, when mixed with water, closely mimics the chemical composition of natural nectar. “When you mix sugar water like that, that is about the same percentage of sugar they get from nectar in flowers,” Bassett said. Avoid brown sugar, organic sugar, turbinado and other natural sweeteners. Honey, for example, can promote dangerous fungal growth in your feeder. Organic, natural and raw sugars contain levels of iron that could harm hummingbirds. “It turns into a brown syrupy gunk in your feeder that is so viscous they can’t drink it, and it is hard to clean,” Bassett said. Avoid the temptation to brightly color your homemade nectar with food coloring. Many store bought hummingbird food is tinged with red food coloring under the auspice of attracting birds. In reality, experts say has no impact on how often the birds will frequent your feeder. Due to the dense concentration of cones in their retinas, hummingbirds’ eyes are more sensitive to colors in the red and yellow parts of the color spectrum, but their affinity for red is learned and somewhat coincidental. According to Hawkins, red flowers are more likely to be replete with nectar, in part because insects are blind to the red part of the color spectrum and will skip them. 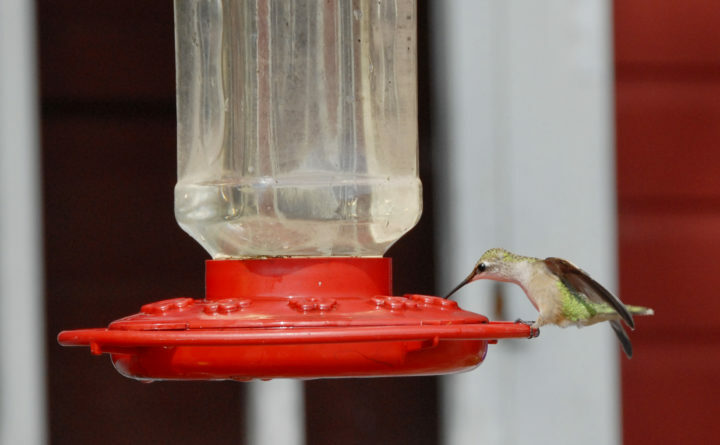 Though red feeders are popular because of this common misconception, Basset and Hawkins agreed that generally color does not matter because hummingbirds are quick to learn where the good sources of nectar are located. “If it’s a hummingbird feeder a hummingbird will figure it out,” Bassett said. “I’ve seen ones that I had no idea were hummingbird feeders.” Bassett described a hummingbird feeder he once saw that resembled a lighthouse. The most important consideration when you are purchasing a feeder is whether it is easy to clean. Another concern when it comes to feeding hummingbirds: bugs. Bees and ants enjoy sugar water about as much as birds and may start to overrun your feeder if you do not manage it well. “Bees are only coming to a feeder because they can access the sugar water because the feeding port is right up against the liquid,” Hawkins said. Hawkins said to look for a “basin-type feeder,” which has a bowl that holds the sugar water below the port where hummingbirds drink. “It isn’t always obvious when you buy a feeder which one has liquid below the port and one doesn’t,” he said. If bee problems persist, Hawkins suggested filling one feeder with a 5-to-1 ratio of water to sugar and the other with a higher concentration of 3-to-1. “Bees love the 3-to-1 and will go there, and the hummingbirds will go to 5-to-1,” Hawkins said. If the hummingbirds had their druthers, he explained, they would likely go for the sweeter water, but they are happy to congregate around the less sweet option to avoid bees. “They really divide it up,” Hawkins said. Hawkins cautioned against using strategies like spraying cooking oil on your feeder to keep bees away. “It well might keep away bees, but the hummingbirds could get oil on their feathers and have no way to remove it,” he said. Your feeder will need one more thing: an ant guard, which hangs from your feeder and uses bird-safe Permethrin to repel the pesky bugs away from your tasty nectar. Cleaning is an essential part of maintaining your hummingbird feeder for the health of the birds that stop there for a snack. Try to hang your feeders in the shade to prevent them from fermenting, and only fill your feeder with as much food as the hummingbirds will eat every few days between cleanings — this will entail some observation on your part, but starting with half-full is a safe bet to start — to prevent mold. If it is warm, change the food at least every three to four days with a new batch to keep it fresh (in chilly temperatures, Hawkins said you could probably check the feeder every week). Check the feeder every time you change the food to see if any gray mold has formed inside. Clean your hummingbird feeder about once a week with warm water, a few drops of bleach or white vinegar and a bottle brush. If your feeder is dirty, try adding some grains of dry rice to the solution as an abrasive and shake vigorously. Once clean, rinse thoroughly, at least three times, with fresh water and let it dry. With this irresistible nectar recipe and proper feeder maintenance, you will have many hummingbird visitors as they pass through your area.